You can now search board positions on SL's pages. It is a full featured search that should satisfy all your search needs. Please read about requirements and usage below and report errors to BugReport or suggestions to the forum of this page. Clicking on an empty board position: set stone with the current color (top left). Clicking on a stone: remove the stone from the board. Shift + Click: do not alternate color. Useful for adding many stones of same color. Ctrl + Click: do not alternate color, but use other color. Useful for adding many stones of same color. Wildcards: set a wildcard search, e.g. point either empty or black stone. Pattern area: add or remove board points to/from search pattern. You can set multiple points when holding the mouse button down and moving around. Automatic: each stone adds surrounding board points to the pattern area. Full board: marks the complete board area as part of the search pattern area. Side pattern: marks the right half of the board as part of the search pattern area. Edge pattern: marks a small area at the lower edge of the board as search pattern area. Corner pattern: marks the upper left corner as search pattern area. Reversed colors: if reversed colors is checked, then the search may find positions where black and white stones are reversed, i.e. a black stone in your pattern is a white stone in the search result and vice versa. You can change the goban size to any size as long as it's 19x19 or smaller. Rectangular boards are fine. Important note: changing the board size has no effect on the position search, unless you include edge points in your pattern. I.e. searching a center pattern (no edge points) on a 9x9 board will yield search hits for 19x19 boards too. If you want to ensure that only specific board sizes are searched for, then include all four edges into your pattern (e.g. by adding two opposing corner points to your pattern, see example.) Note that if you include four edges, you are basically limited to a full board search. The pattern area to search for is marked a little bit darker than the board. If a point (even with a stone or wildcard stone on it!) is not on a darker area, it is not part of the search pattern. If the pattern contains an edge point then the pattern only searches along the edge. That means that edge points anchor the pattern along the direction of the edge. Note that due to rotations you can still find edge patterns at the other side of the board. The pattern area can have any shape it can even be comprised of two or more disjoint areas. The next moves shown are moves that occur in the pattern. Follow-up moves outside the pattern are not shown. Also, for efficiency reasons, only follow-up moves of the current result set (usually 50 pages, up to 250 diagrams) are shown. Therefore, the follow-up moves and their order may change if you forward to the next 50 hits. PJTraill: Could we please have a more detailed specification of which position diagrams a pattern should match? I.e. are the following statements and those in the above diagram true? or in the pattern matches anything in the diagram that represents a stone of that colour. I.e. markings on stones (square, triangle, etc.) are ignored, so matches , , , and . Empty points in the pattern match anything in the diagram that represents an empty point. I.e. markings are ignored, so that an empty point also matches one with a letter, , , or . A diagram with moves (i.e. , , ... / , , ...) matches a pattern if that matches a position that arises when one plays out the moves in the diagram. ¿Or does a pattern only match the initial or final position? — ¡ :-( ! I think this is implied by “The next moves shown are moves that occur in the pattern”, but I am not sure what that means!
? : marks an empty point that is not part of the pattern. A: wildcard: either empty point or black stone. V: wildcard: either empty point or white stone. *: wildcard: either black or white stone. You can use this to store searches for others. Have a look at the examples. The maximum board size that is indexed, is 19x19. So some diagrams can not be found. Any size below 19x19 is fine. Even rectangular boards (see examples). The index is updated once a day, so if an edit removes a diagram, the search result may be inaccurate. The search automatically tries all 16 variants of the position (rotation, mirror, color reversal.) There is only an option for omitting the color reversal, but no option for searching specific variations. To start a predefined search, just click on the spyglass icon. Search for a ko anywhere on the board. Search for a net position anywhere on the board. Search for a ko on the edge of the board. 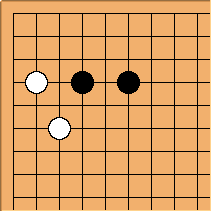 Search for a san ren sei position to occur on one side of the board. Find any boards that are either one line high or wide. Search 9x9 boards, where the opening move is at the center point.